Three companies have sent me items to review and reviews of them follow. It is always fun to try out new technology gear! I am always on the lookout for ways to mount my devices in the car and around the house. MagBack for iPad is one neat solution! MagBack for iPad bills itself as the "world's thinnest iPad mount". The MagBack kit consists of two magnetic MagSticks, that can be mounted anywhere, and two MagBack Pads that mount to the back of the iPad. 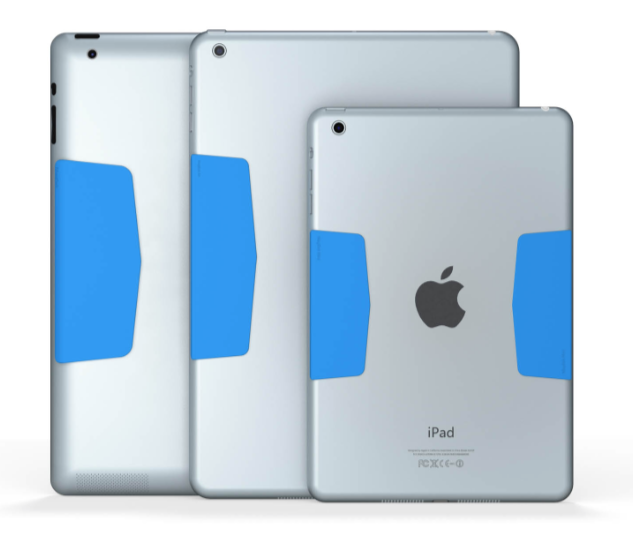 The MagBack is available for all models of the iPad Mini, iPad 2/3/4 non-Retina, and iPad Air 1 and 2, and comes in a variety of colors. The cost of the MagBack is $39 and you can also buy 3 sets of extra MagSticks for $19 to use to mount the iPad to additional places around the house or in your car. There is a template included in the package to ensure you get the MagBack Pads aligned correctly on the back of the iPad. These MagBack Pads also provide a nice gripping surface when you are carrying your iPad. The Apple iPad Smart Cover does not interfere with the MagBack Pads (and vice versa), since the MagBack Pads mount on the short sides of the iPad. Here is a another review of the MagBack for iPad that includes additional screenshots and a video demonstrating the process for installation. MagBack is also accepting pre-orders for its MagBack for iPhone. In this model, the "Pads" are built right into the phone case and there is only one MagStick needed. ThinkWrite was formed in 2013, and designs low-cost mobile device accessories to support the education market. They sent me their headset (headphone and microphone combo) to review. This low-cost headset sells for $19.99 and volume discounts are available. ThinkWrite specifically made a headset to meet the needs of schools. It is very durable and is made from special plastic that allows the headset to be bent (as kids are likely to try) without breaking! The headset is constructed with a "pleather" material that is easy to clean and provides padding and adjustments to fit any child's head. Take a look at how indestructible they are! The inclusion of a mounted microphone that sits close to the student's mouth makes these very useful for students recording narratives and podcasts since the classroom noise level is kept to a minimum. And there is an in-line volume control to easily allow students to moderate the sound on something they are listening to. Teachers are always on the look-out for low-cost technology solutions for their classrooms, and I think these ThinkWrite Headsets are a winner! I have been a proponent of the Reflector app since the day it was introduced (when it was called Reflection). The Reflector app turns your Windows or Mac computer into an AirPlay device, allowing one or more devices to mirror their screens to your computer via WiFi or Bluetooth. If your computer is hooked up to a video projector, of course, the teacher and students can share their findings, work, or questions with the rest of the class. And it makes it easy for a teacher to roam about the classroom and clear up misconceptions by mirroring their device screen to the "big" screen. One of my favorite features of the Reflector 1 app is the ability to record the activity on the screen of the mirrored iOS device while it is mirrored to the computer. As one who creates lots of instructional videos, I use this feature daily. Even the sound comes over to the computer so it is included in the movie I produce. In a classroom, the ability to easily record an iOS device screen is invaluable when a teacher needs to record an on-going lesson for an absent student, for parents, or by wanting the ability to record a student's work for their digital portfolio. However, Reflector 2 ($14.99 per single license with volume licenses available) has bumped up the capabilities of the software! Devices running various operating systems can now mirror to the same computer! And whether the device is an iOS device, an Android device, or a Chromebook, the mirrored screen can be recorded! This is a wonderful addition for BYOD/T environments where students may have a mix of iOS devices, Android devices, and Chromebooks in the same classroom. Reflector Director is an iPad app ($6.99) that allows the teacher to handle the emphasizing, hiding, and previewing of mirrored device screens on the computer from the iPad, rather than having to sit at the computer to do so. Reflector for Amazon Fire TV and TV Stick ($6.99) allows one to mirror a Mac computer, Windows computer or Chromebook (in conjunction with AirParrot 2) to a Fire TV or Fire TV Stick as well as mirror any iOS device to your TV that has an Amazon Fire TV Stick. With all of these features, Reflector 2 meets the needs of teachers and students no matter what device they are using or need to share!